Book, music and lyrics by Phil Willmott. J M Barrie’s Peter Pan is currently proving the inspiration for many a new piece of theatre the most recent of which, Phil Willmott’s musical Lost Boy, has just transferred to the Charing Cross Theatre. 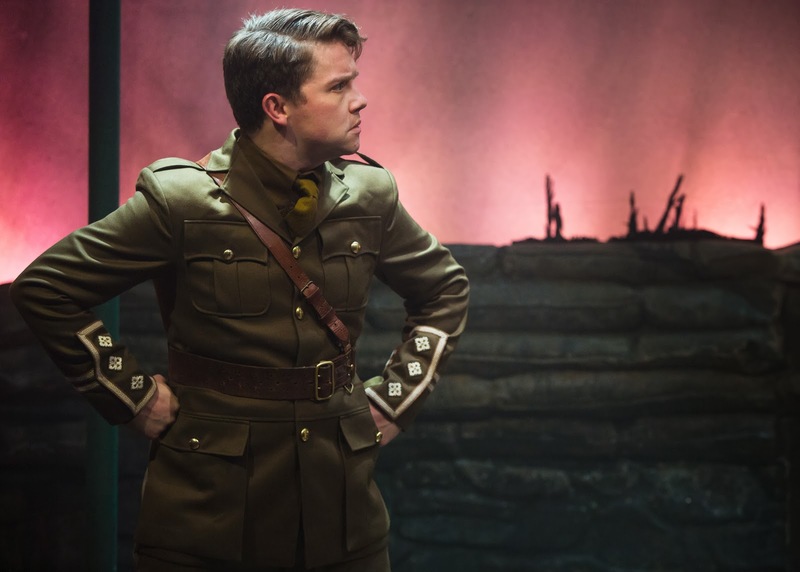 Focusing on George Llewelyn-Davies (a stirring performance from Steven Butler), one of the real-life inspirations behind Pan and set during the First World War, Llewelyn-Davis dreams of being the boy that never grew up, poignantly considering the nightmare that his generation has to face, sent out to fight whilst on the cusp of adulthood. The audience is made aware of being taken on an “awfully big adventure” and as we begin this year that commemorates the centenary of the war’s outbreak, there is an enormous sense of foreboding as we are introduced to the story’s young boys. It's a brilliant concept and to begin with the 'grown up' versions of Barrie's beautifully crafted characters are entertaining, cleverly suggesting their Neverland charm. It quickly becomes apparent though that you can have too much of a good thing. Wilmott’s plotlines become too complex, finding little room for the development of the multitude of stories. That being said, the many subplots do provide the cast of 12 with an opportunity to showcase their talents. Joseph Taylor gives an enchanting Michael Darling, Joanna Woodward an impressively gutsy Tinkerbell and Richard James King sings, arguably the best song in the piece, 'Jungian Dream Analysis' displaying brilliant comic timing to re-inspire us at the opening of the second act. The music – executed brilliantly by Isaac McCullough’s on stage trio of keyboard, clarinet and cello – tries to marry together contemporary styles and sounds with Edwardian Music Hall. The two don’t integrate well but, again provide a platform for the talents in the cast and in the final moments of the show the sound of the youthful ensemble is powerfully moving. Having just moved across London from the Finborough Theatre it’s apparent that the show has had an opportunity to grow. It’s a charming idea, with incredible potential and is a moving tribute to the lost boys of the Great War.